Most of our Reptiles and Amphibians can be found in the beautiful displays inside our Rainforest Diner. They have been individually designed by Andy Ferguson, owner of L.A. Reptiles in Lincoln, as a donation to our charity. He has done such an amazing job at designing and hand-installing them; adding specialist props and features for each individual species needs. Come along and view these incredible creations and the reptiles & Amphibians living within them. 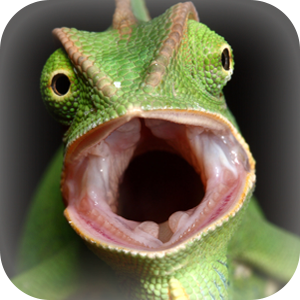 If you or someone you know is not too keen on reptiles then don’t worry, we have ample seating both inside and outside The Rainforest Diner away from the displays. Our Caiman is a beautiful lady who came to the park in 2017 looking for a new and larger enclosure as she grows. There are different sub-species of Caiman and the largest can grow to up to 5 metres in length. They are part of the Crocodilia family but are actually known as a separate species to Crocodiles. They are predators, like alligators and crocodiles, with the majority of their diet consisting of fish as well as small birds, reptiles, mammals and insects. Due to their ferocious nature, they do not have many natural predators and human killing of this species is not as high as that of Crocodiles. Caiman skin is much tougher and stiffer, so is less desirable for trade purposes. 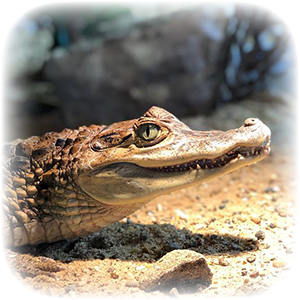 Our Caiman lives in a specially adapted enclosure next door to our Kookaburra and Reticulated Pythons. She has a large, deep pool to immerse herself in and plenty of natural foliage to mimic her wild habitat. She is quite a docile Caiman, so will often lay and bask under the lamp or sit underneath the waterfall for a massage! Set inside our Rainforest Diner is a unique reptile and amphibian display to educate and capture the attention of our reptile loving visitors. If you don’t love reptiles, there is alternative seating away from our display so we allow you to make the choice of observing these creatures in their vivariums or enjoying your dining experience away from them. 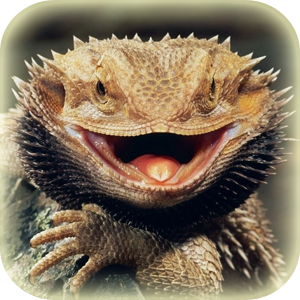 The Bearded dragons are favourite among visitors because of their characteristics and colour changing abilities. Their signature ‘Beard’ will change to black to assert dominance and their bodies vary in colour to adapt to heat or mood changes. They are very interesting to watch as they move around their vivarium or bask under the warm lamps, they often display different hand waving gestures and head bobbing as they square up to you… probably jealous of your food! One of the newest members to our display is the beautiful Yemen Chameleon, a creature which is very good at hide and seek! He blends in very well with his surroundings so take some time to study his vivarium and see if you can spot him! Also known as a Veiled Chameleon or Cone-headed Chameleon, they live in a large range of habitats in the trees and large plants of mountains and valleys. They are omnivores, so will eat a variety of plants and insects, particularly using plant matter as a source of water. Newly hatched young are pastel green in colour and develop stripes as they grow. Adult females are green with white, orange, yellow, or tan mottling. Adult males are brighter with more defined bands of yellow or blue and some mottling. We have more snakes than any other reptile at Lincolnshire Wildlife Park, they are fascinating creatures and all very different from one another; both in looks and characteristics. Snakes can have very different morphs; morphs being the colour variation of a certain species. There are hundreds of morphs found in corn snakes alone. We have a Royal Python in quarantine at the moment which are rather difficult to spot because of their great brown and tan camouflage in the woodland undergrowth of forests. 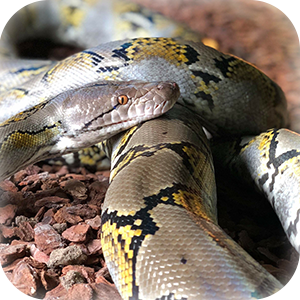 We have a Yellow Anaconda… don’t worry, he’s only a junior snake at the moment so he is not very large and will be moved to a larger enclosure once he has out-grown his custom made vivarium in The Rainforest Diner. Then we have a Reticulated Python in our Caiman Cave near the Nature Reserve. The Reticulated python is the largest snake in the world and amongst one of the three heaviest species in the world! Quite a new addition to our display are our Leopard Geckos and true to their name, they have leopard markings which are vibrant and very attractive; but can also be very varied in captivity. They have some very unique features, one of which being that they have movable eyelids! They are unable to climb up smooth surfaces so are mostly ground-dwelling lizards, living in the rocky grasslands of South-Asian Afghanistan, Pakistan & North-West India. 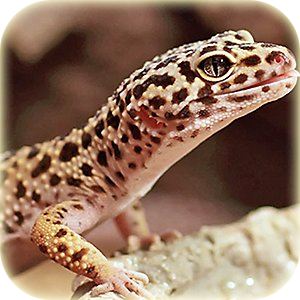 The Leopard Gecko is quite large in comparison to some other species and mainly eat insects such as crickets, roaches and meal worms. You can find them and lots more information about them inside The Rainforest Diner when you next visit! The Asian forest scorpion’s native habitat ranges from India to Malaysia. It is a large, stocky, heavy, black scorpion that may grow up to five inches in length. They primarily live on the surface under rocks and logs, but do occasionally burrow. They look very much like emperor scorpions and sometimes will be mistaken for them when sold within the pet trade. 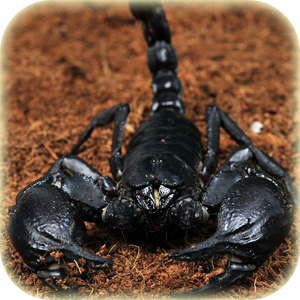 The forest scorpion is more aggressive than the emperor scorpion. They can be kept in groups, but it is not recommended due to their aggressive nature. They will assume a defensive posture more easily and are more likely to protect themselves with their pincers. The venom from an Asian forest scorpion’s sting is mild but can be quite painful, and has been compared to the sting of a Hornet. 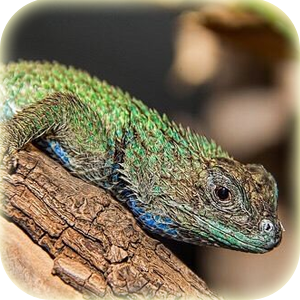 Also known as the Green Spiny Lizard, the Emerald Swift has bright green and blue markings and males are usually more brightly coloured than females. They are native to Central America and spend most of their day basking in the sunshine, if the temperature becomes too hot or when they need sleep, they will retreat to a burrow or under rocks to cool off and rest. The Emerald Swift has only recently become a species of it’s own, it used to be classed as a sub-species to the Mexican Emerald Spiny Lizard. This is one of the newest additions to our reptile display within The Rainforest Diner. 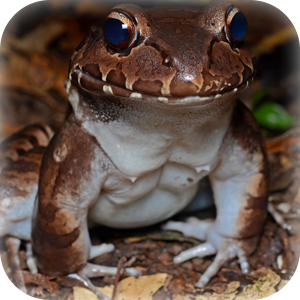 The Smoky Jungle Frog is a heavy, robust frog that many will mistake as a toad because of his appearance. They are nocturnal, so are more active in the evening but he most definitely noticeable within his enclosure. It has been custom made to mimic his natural surroundings in the sub-tropical and tropical forests, swamps, rivers & marshes of South America. They have smooth skin and their bodies are a reddish brown colour with broad red/brown marks. They like to burrow so will often be seen under plants or fallen plant leaves & under rocks… see if you can spot him hiding! At Lincolnshire Wildlife Park we have two different species of Dendrobates (dart Frogs); they are Tinctorius (Giant Orange) & also Azureus (Blue). 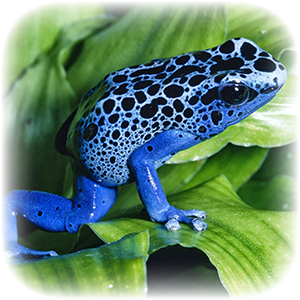 They are very interesting creatures with different pattern types and no frog has the same pattern. There are many different colour variations of Dendrobates, which is the collective name for this species. All variations are toxic if consumed and can cause pain, cramping and stiffness. Their bright colours act as a defence mechanism to warn animals looking to consume them. They are usually harmless for humans to handle, but if handled roughly then the toxin can be secreted causing the same problems as when they are consumed. 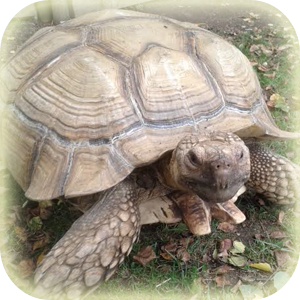 Our tortoises are of all shapes and sizes ranging from our smallest of just a few inches, to Albert our largest Tortoise, weighing in at 5 stone! 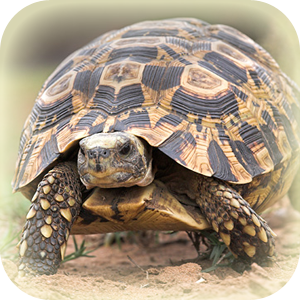 Sulcata Tortoises are the third largest species in the world and the largest of the mainland species, they are quite interesting to watch with their prehistoric characteristics. Surprisingly, they can move quite quickly in warm climates but will slow down to almost a halt in cold weather which can be quite dangerous if left exposed for too long. So if you visit in the winter months when it is particularly cold, please be patient with them as they may chose to stay in their house where there is heat lighting, to avoid a potentially fatal exposure outside. Our little Hinge-back Tortoise is displayed with our other Reptiles, instead of being with our larger Sulcata Tortoises outside; this is because he is so small and needs plenty of heated lighting. His vivarium mimics the dry woodlands of Africa where he originates from and he loves to bask under the light. He is quite different to other tortoises, in the way he looks and his diet; he needs at least 40% mushrooms in his diet, providing him with vital Vitamin D. His shell is a very similar colour to that of other Tortoise species, but the back juts down at a 90 degree angle to cover his back end. This is to help protect him from predators that attack from behind… a vital defence mechanism for such a slow mover!